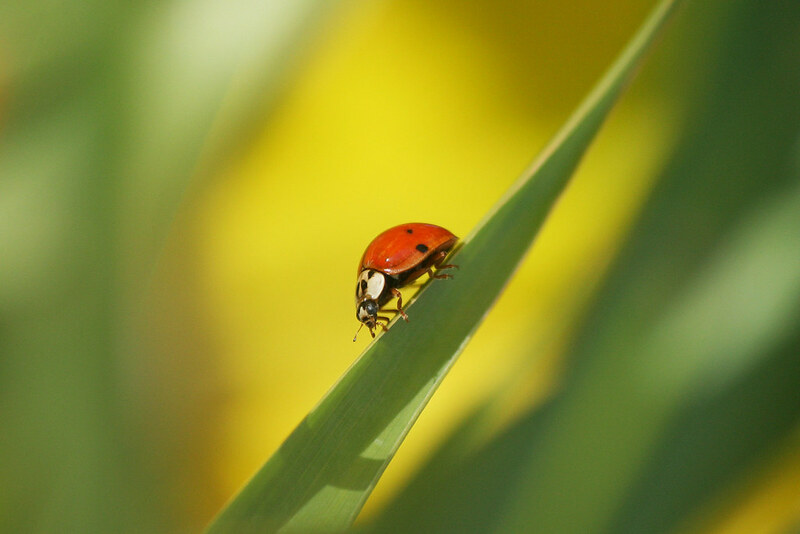 A Multicolored Asian Lady Beetle (Harmonia axyridis) on a blade of grass. This beetle is native to eastern Asia from the Altai Mountains to the east coast and Japan. It was first introduced into North America in California in 1916. It has been used extensively for aphid control on crops, and consequently it is now found throughout the US and Canada. The adult is highly variable in color and pattern. In the east, the elytra (hard shiny wing cases) range from orange to red, with many to no black spots. In the west, some individuals are black with two large red patches. This is obviously one of the orange colored variety. While the Asian Lady Beetle did serve a purpose once upon a time, they are now common autumn pests who literally infest houses across Minnesota. I have found that the chemical Tempo works best to kill these and box elder bugs.